A far right racist populist party has entered the German parliament for the first time in 60 years after today’s federal elections. And the AfD makes its breakthrough as it moves even further to the right – in the direction of fascism – through a series of internal faction fights. It is those internal divisions that have led to the shock resignation of Frauke Petry as party leader, on the day of her own election to parliament. The AfD took third place in the election, with 12.6% of the vote – around the level predicted in opinion polls. Antiracists and antifascists responded with protests in several cities as the results came through. Angela Merkel’s conservative CDU/CSU coalition has been returned to power but on a much reduced vote of 32.9%, down from 41.5% in the 2013 elections, while the centre left SPD was second with 20.5% of the vote – a historic low. The leftwing Linke (Left) party took 9.2%, with 8.9% for the Greens and 10.7% for the pro-business FDP. But the headlines are all about the far right AfD, whose vote is nearly three times the 4.7% it took at the last elections in 2013. It is set to have 94 MPs in the new Bundestag parliament, nearly a sixth of the total, although Petry has said she will take her own seat as an independent. The AfD’s election success comes after months of the most extreme right faction – that closest to fascism – pushing the party so far to the right that it has, in effect, left Petry behind. Her resignation took her colleagues by surprise, but it is not the first time the AfD’s extreme right has driven forwards leaving the party leader stranded. The hardline elements of the AfD, centred around deputy leader Alexander Gauland and Thuringia-based Björn Höcke, have won a double victory – they have an unprecedented national platform in the Bundestag for the AfD and they have gained the upper hand in the party’s internal battles. This is a second round of a hardening up of the AfD’s politics and a new shift towards fascism. As with other European countries, the German election reflects an increasing polarisation, with a section of voters moving away from the mainstream of Angela Merkel’s conservative CDU and the centre-left SPD. The AfD’s racist rhetoric has pulled in many of those alienated by the traditional parties. The chart above, based on exit poll data, shows that it gained 1.28 million votes from previous non-voters (purple) – the largest slice. More than 1 million voters switched from Merkel’s CDU/CSU union (black). Another half million came from the centre left SPD, whose vote has been plummeting for years as a result of its failure to defend working class interests and differentiate itself from the right. 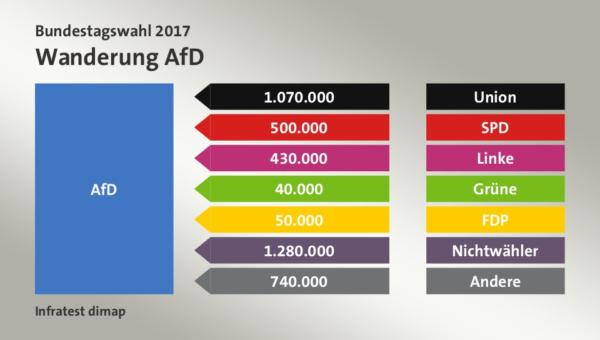 It is both disappointing and worrying to see that the AfD has also gained 430,000 votes from the Left party, although the Left’s percentage vote increased overall slightly in this election. The AfD (Alternative für Deutschland, Alternative for Germany) was founded in 2013 as a Eurosceptic party, won seven MEPs in 2014 and now has a presence in half of Germany’s 16 powerful state governments. It is the second largest party in the eastern state of Saxony-Anhalt. 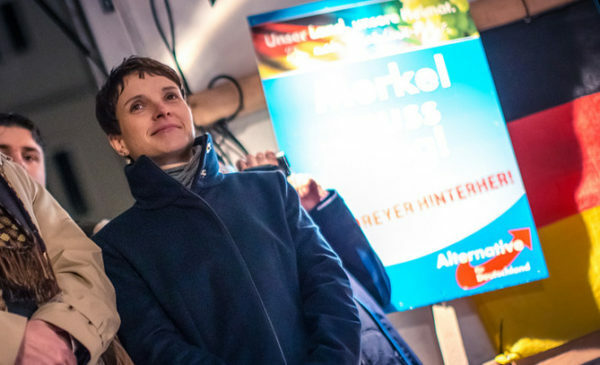 Its leader until last night, Frauke Petry ,took charge in 2015 after a factional battle that was won by the party’s most rightwing and extreme racist elements. Founder and former leader Bernd Lucke and his more moderate allies quit the party when Petry seized the reins, claiming it had been infiltrated by racist, nationalist, antisemitic, Islamophobic and homophobic extremists. 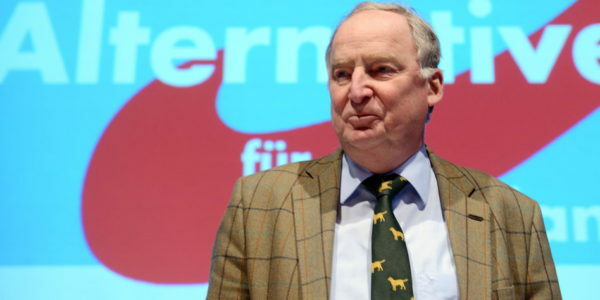 Since then the AfD has sought to grow by exploiting and encouraging Islamophobia and feeding on the “refugee crisis”, directing racism against immigrants. Petry has declared that police should be able to shoot people crossing the German border “if necessary”. In addition to its main racist thrust, the AfD is also anti-abortion, and defends the so-called “traditional family”. Petry and her supporters made overtures to the Pegida anti-Muslim racist street movement, described as “natural allies” by AfD deputy leader Alexander Gauland. Pegida – whose marches at their height have attracted many thousands – is a foul racist soup, in which members of the NPD and other nazis mingle with fascist football hooligan gangs and softer racists. Petry hosted a meeting of far right and fascist leaders from across Europe in the town of Koblenz, in January 2016, lining up alongside Marine Le Pen, leader of the fascist Front National in France, Dutch far right racist PVV leader Geert Wilders and Matteo Salvini from Italy’s Northern Leagues. A month later, the AfD announced an alliance with Austria’s Freedom Party (FPÖ) – a move that prompted the European Conservatives and Reformists group to seek to expel the two MEPs who remained part of the AfD following its split. But the AfD has since been engaged in another round of factional manoeuvring and a new push rightwards by those who are happy to rehabilitate elements of Germany’s Nazi past, leaving Petry in what is now the more moderate wing as the hardliners drive past her. Björn Höcke, an AfD member of the state assembly in Thuringia and a poster boy for the extreme wing of the party, repeatedly expresses views close to those of the nazi NPD party. Germany should stop atoning for its Nazi past, Höcke says, claiming that the country’s history was being made “appalling and laughable”. We Germans are the only people in the world who have planted a memorial of shame in the heart of their capital. These stupid politics of coming to grips with the past cripple us – we need nothing other than a 180-degree reversal on the politics of remembrance. It is clear what a “180-degree reversal” on the politics of remembering the six million Jews and millions of others murdered during the Holocaust means. Breivik became a mass murderer out of pure desperation. We have the right to take back our country and our history. If the French are rightly proud of their emperor and the Britons of Nelson and Churchill, we have the right to be proud of the achievements of the German soldiers in two world wars. Gauland has also attacked Germany’s commissioner for migrant integration, Aydan Özoğuz, who has Turkish origins, saying she should be “disposed of” in Anatolia, using a phrase usually reserved for getting rid of rubbish. Once you are able to speak the unspeakable, people will begin to think the unthinkable and that is how you beat the establishment. But the increasingly pro-Nazi rhetoric spouted by the faction around Höcke and Gauland is aimed not only at whipping up racist support during the election and painting the party as brave “anti-establishment” figures, but also at hardening up the AfD’s politics and pushing it towards fascism. This is the party that is set to make its electoral breakthrough and will now form a substantial part of Germany’s parliament. The combined advance of the AfD in the electoral arena and the remaining threat of Pegida on the streets – with organised fascists tying to pull both wings further to the right – gives cause for alarm for antiracists and antifascists across Europe.